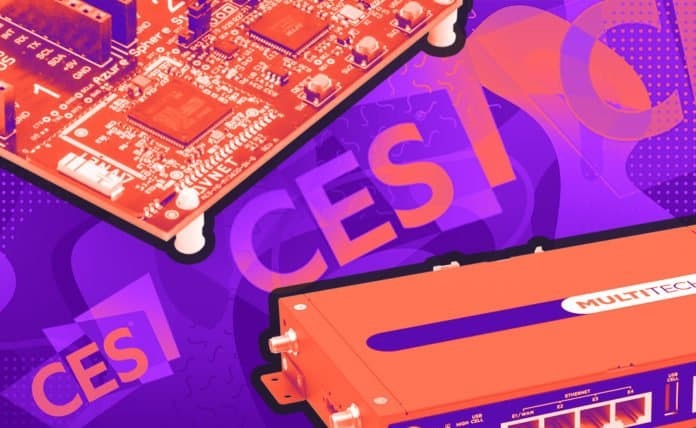 At CES 2019, we sat down with MultiTech and Avnet, two leading hardware companies in the IoT space, to discuss their plans for 2019. In this article, we’ll be covering a new partnership and platform by Multitech, as well as new product offerings by Avnet, and what developers can look forward to in the coming year. As technology becomes more advanced, hardware companies are looking for more ways to innovate. Companies like Atomsic are focusing on preserving battery life with their energy harvesting technology. Others like Oticon, which makes intelligent hearing aids with a built-in personal assistant, are committed to creating custom hardware solutions that fit niche verticals. Derek Wallace, the Director of Product Management at MultiTech, sat down with our team to discuss MultiTech’s plans for 2019, with a focus on new product updates and partnerships. MultiTech, a leading global manufacturer of M2M and IoT communication devices, announced the Multitech University Program at CES. MultiTech’s program provides students with access to solutions within its product line, focusing on LoRa-certified products. As part of the program, MultiTech partnered with CattleFit and Colorado State University to develop a remote health monitor for the beef cattle industry. The CSU students working on the solution believe that it will provide important data on the health of the beef cattle, increasing efficiency and profitability for ranchers. MultiTech also announced the Sense2Grow platform—their joint solution with Technolution, which is equipped with a MultiConnect Conduit IoT gateway and LoRaWAN connectivity. The solution has already been deployed in the biggest rose greenhouse in Porta Nova, the Netherlands, giving them access to highly detailed data on the growing conditions in their greenhouse. The Sense2Grow platform demonstrates the benefits of using LoRa-standardized sensors to capture vital, hard-to-reach information without relying on unpredictable cellular coverage. Technolution and MultiTech believe that the solution can work in more Industrial IoT (IIoT) settings. They’ll be focusing on expanding their solution throughout 2019. Wallace also let us in on a secret that MultiTech has an even bigger announcement lined up for the end of January, so keep your eyes and ears open for more exciting news. We sat down with Lou Lutostanski, the VP of Internet of Things at Avnet, to discuss their new Avnet Azure Sphere MT3620 Starter kit, which supports rapid prototyping of highly secure IoT projects. Unveiled in 2018, Azure Sphere is Microsoft’s end-to-end solution for microcontroller (MCU) powered IoT devices, with built-in security from the chip level to the device OS and into the cloud. In addition to the usual configurable GPIOs and serial ports, this development board includes a dual-band WiFi chip antenna, a system clock, as well as built-in sensors (temperature, pressure, light, accelerometer, gyroscope) and connectors for external devices like Grove sensor modules and MikroE Click boards. Along with the starter kit, Avnet demoed new IoT products and services at CES for engineers and entrepreneurs. Their new solutions are meant to simplify the development and deployment of IoT solutions. One example is SmartEdge Agile, an IoT edge device that allows engineers to build secure applications using machine learning and AI through a zero-code interface, making advanced software algorithms more accessible and easy to use. With the average industrial IoT project lasting 18-24 months, the SmartEdge Agile is designed to accelerate time to market, from prototype to production, in as few as six to eight months. On top of its hardware offerings, Avnet also runs hackster.io, a robust publication that has grown into the leading developer community centered around hardware and electronics. Their network of makers, engineers, and DIY enthusiasts has generated tutorials and videos for thousands of projects spanning hardware, software, and cloud platforms. Hackster is also a leading resource for learning, building and sharing technology. As IoT continues to mature throughout 2019, we can expect to see several trends become more prominent. First and foremost is the importance of security in IoT systems, from the device to the cloud. Products like Avnet’s MT3620 Starter Kit and Microchip’s AVR-IoT development board were co-developed with enterprise Cloud partners to protect customer data and prevent exploits like the Mirai botnet attacks from ever getting off the ground, whereas many current devices remain unsecured and vulnerable to emerging threats. Second is the advancement of edge computing in both products and solutions to meet growing customer and business needs. This can be seen through Intel’s Neural Compute Stick 2, which helps accelerate AI development at the edge, and software like Octonion’s Brainium platform, which helps engineers leverage ML and AI algorithms without needing a data science background. Finally, developer hardware will become increasingly modular and interoperable across technology stacks and platforms. Particle’s Mesh boards for WiFi + BLE, Cellular + BLE, and the DotDot 1.0—an open specification for communicating across different types of smart home technologies—are two examples of this trend toward interoperability and modularity. Over time, the primary focus of developers and engineers will evolve from how to build an IoT solution, to what needs to be built.